Vermont Woman is a forum for news, issues, features, arts and entertainment from the perspective, experience, and voices of Vermont women. Vermont Woman's publishing history includes most years as a monthly; most recently seasonally, and currently during a transition period, bi-annually. This website is an extension of the print publication, but not all, articles are posted here. We encourage our readers to contact us, either here on the website or at our Facebook page. Trumpsters are being suckered? We know it, and we don’t care. Patriot? Oh my God, yes! I just love the flag. And I get all teary when I hear the national anthem. Reckless vote? I wanted to shake things up, so I voted for Trump. Also, I love reality TV, and Trump is entertaining by the hour! Compassionate? Of course, I am. Dumb question. But I got mine, Jack, and I shut the door behind me. Tight. Real tight. If that's not compassion, then I don't know what is. I recently attended two memorials, back to back. One was for a man, a vibrant engaged man, at the peak of his work life, a middle-aged father of two, taken out violently and unexpectedly. The other was for an older woman, who had been gentling out of her life for the last several years and was ready for her departure. The man, called Davan, I had met only once but instantly liked and appreciated. Passionate and present, his sudden departure from a head-on collision was shocking. No one was prepared, including, I suspect, himself. The woman I had known for years. Her end was anticipated and prepared for and had a certain rightness to it. 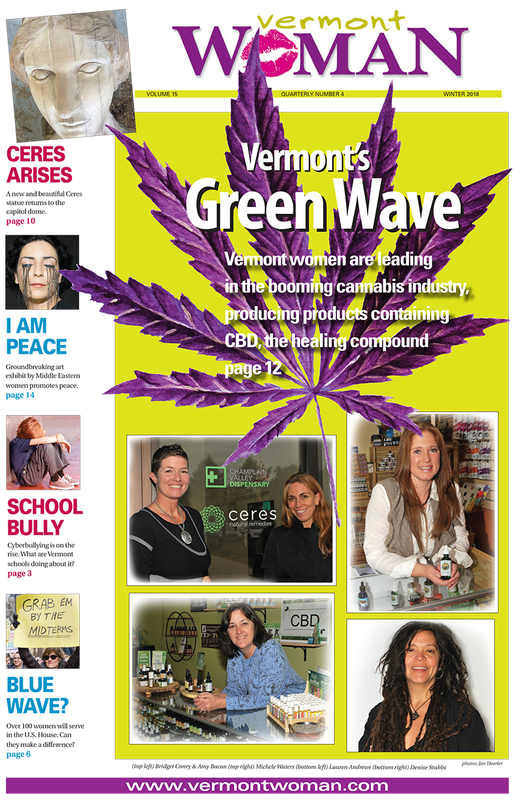 Cannabis is a dynamic and rapidly expanding industry in Vermont. It’s also the fastest growing in the country with sales expected to reach $6.7 billion in total this year. Women are at the forefront of this burgeoning industry, nationally and locally, in every aspect—as growers, advocates, scientists, herbalists, and business owners. In Vermont, the legalization of marijuana for personal use in July 2018 gave the people already growing hemp (legalized in 2013 with Act 84) and dispensing medical marijuana (legalized in 2011 with Act 86) a boost from a new crop of enthusiasts growing their own plants and starting to make their own products. The cannabis industry is not yet regulated or taxed by the state, which means that while people can possess up to one ounce of marijuana, they can’t sell it. There is, however, a cannabis product that people can, and are, selling: cannabidiol, or CBD. CBD, a compound found in both hemp and marijuana (both members of the genus Cannabis), is known to have healing benefits but is not intoxicating like tetrahydrocannabinol, or THC, the compound that gets you high. THC is present in marijuana (Cannabis sativa or indica), at 5 to 35 percent, but occurs minimally in hemp (a nonpsychoactive variety of C. sativa), at less than 1 percent. Hemp is often bred to contain high levels of CBD, and people are rushing to make products with it that are legal, beneficial, and profitable. If you’ve come through Montpelier in the last several months, you probably noticed the scaffolding around the top of the Vermont State House, indicating work in progress. Upgrades have been done on the drum of the dome, as well as a shiny regilding of the copper-sheathed dome itself. But most striking is the empty space at the top—no statue! We take it for granted that “she” will be there, framed by trees and sky. It’s been a bit of a shock to see our iconic statue gone. What happened? Where did she go? This year, we Vermonters are privileged with a historic opportunity to honor our symbolic home-grown statue. A newly carved version is being created, soon to regain her freshly gilded “throne” on the capitol dome (scheduled for November 30). This new sculpture is the third incarnation of Vermont’s female icon, which has been called Agriculture or Ceres. Vermont is one of nine states with female statues on their state capitols. Most have versions of a personified Freedom or Liberty, similar to the US Capitol building, upon which the bronze Statue of Freedom stands. Missouri is the only other state with a Ceres on its state capitol in Jefferson City. That building, however, is much taller, and Ceres appears celestial and remote. Vermont’s Ceres is closer to the people, with a more personal feel. We can relate to her. As a mythic scholar, I can’t help but see her as Vermont’s goddess, not in a sense of ultimate divinity but as a personification of a living energy or archetype universally rooted in our lives. Our Vermont statue has personal meaning for each of us, honed over years of Vermont history and tradition. I AM, at the Cathedral Church of Saint Paul in Burlington, Vermont, is a groundbreaking exhibition of 31 important women artists from 12 Middle Eastern countries. An exhibition of contemporary art by Middle Eastern artists immediately commands our attention, in part because we rarely get to see any contemporary art from this area of the world and rarer still if these works of art are made by women. The 16-month tour of I AM began in May 2017, where it premiered at the National Gallery of Fine Arts, Amman, Jordan, supported by the patronage of Her Majesty Queen Rania Al Abdullah. The exhibit was initiated by Caravan, an international nonprofit arts organization founded by Reverend Paul-Gordon Chandler in Cairo, Egypt. The goal of Caravan is to build understanding and peace among the cultures of the Middle East and the West through visual art. The organization has mounted annual art exhibits since its founding in 2009. I AM: Contemporary Middle Eastern Women Artists and the Quest to Build Peace—the full name of the exhibit—first traveled to London and then toured around the United States, appearing in venues in Washington, DC, Wyoming, Ohio, Washington state, and Tennessee. Burlington is the last stop on its tour. The exhibit will be on display until November 25. Each artist was invited to create one original two- or three-dimensional piece specifically for this exhibition. Curator Janet Rady, a specialist in contemporary art of the Middle East and director of Janet Rady Fine Art in London, provided artistic guidance to the selected artists. Claire Marie Pearman, Caravan’s director of program development and communications, informed me that the only restriction was that of size. Artwork could not exceed one meter in any direction, in order to limit the expenses of crating and shipping. Surprisingly, the organization did not censor the content of the artists’ work. Many Vermonters are familiar with the heartbreaking story of 13-year-old Ryan Halligan’s suicide in 2003 while he was a student at Albert D. Lawton Middle School in Essex Junction, Vermont. Ryan had been a victim of bullying and cyberbullying for years at the hands of fellow students who started rumors that he was gay and led him to believe a girl liked him, only to have her humiliate him in front of all of her friends. After his death, Ryan’s parents, John and Kelly, shared their heart-wrenching story with many national news outlets and on their own website, Ryan’s Story, hoping to make a difference for others. In addition, John was instrumental in the passage of the Vermont Bully Prevention Bill (Act 117) in 2004, as well as a bill that requires mandatory suicide prevention education in public schools (Act 114, 2006). He describes the friends of those who bullied his son as bystanders. They could have said something or done something, but they chose not to. Instead, John encourages students to be upstanders: “So I beg you. Don’t be a bystander. Be an upstander. Stand up to your friend” (www.ryanpatrickhalligan.org). Cora Brooks, poet, painter, playwright, and longtime peace activist, died peacefully on October 16, 2018, at McClure Miller Respite House in Colchester, Vermont. She was born in New York City, on April 9, 1941, and grew up in Hastings-on-Hudson, New York. She received her BA from Sarah Lawrence College, and after graduation became a research assistant at the Harvard Epworth Cooperative Nursery School. Through the years, she taught writing at several colleges, including Wheaton College, Goddard College, and Lesley University. In the 1980s she helped found Chelsea Help for Battered Women. Cora was an ardent activist, attending numerous protests against the Vietnam War in the 1960s and against nuclear power in the 1970s, getting herself arrested on six occasions. Cora published, through Acorn Press (Chelsea, Vermont), several chapbooks of her poetry, including Heather in a Jar, Ransom for the Moon, and Rinds, Roots and Stars, and a book of writing exercises, The Sky Blew Blue (New Victoria Publishers, Norwich). She wrote several plays, one of which was produced Off Broadway at the Houseman Theater in New York City. Her diaries, poems, essays, book reviews, and letters are in the archives of the Schlesinger Library on the History of Women at the Radcliffe Institute for Advanced Study, Harvard University. Cora lived a thoughtful, intentional life, and she died a thoughtful, intentional death. In April, she announced to friends and family that she was going to cease eating and drinking on September 24, near the equinox. She held true to her word, eating only one basil leaf, one lemon drop, and one lime popsicle after her self-appointed date. She leaves behind her sister, Toni Brooks-Floyd, and brother, Josh Brooks; her children, Oona and Luke Metz; her grandchildren, Lucia, Olivia, Lily, and A.J.—and many, many friends. In memory of Cora, Vermont Woman asked five women friends, who knew her in different ways and at different points in her life, to write about her. Vermont, along with the rest of the country, broke records in voter participation in the midterms, with about 57 percent of the electorate voting, according to data from the secretary of state’s office. More heartening, an impressive 92.5 percent of eligible voters registered in the weeks leading up to the midterm, which bodes well for voter participation in the 2020 general election, when more people tend to vote. The high voter registration rate, above the national average, is thanks, in part, to the state’s new automatic registration system. The forces that galvanized people nationwide to go the polls also got Vermonters out and voting: concerns over President Trump and the direction the country is going. Though Trump wasn’t running for office, the elections were widely seen as a referendum on his policies. In Vermont, the midterms held few surprises, with many incumbents retaining their seats, including everyone in the executive branch of state government: the lieutenant governor (David Zuckerman), treasurer (Beth Pearce), attorney general (T.J. Donovan), secretary of state (Jim Condos), and auditor (Doug Hoffer) all won reelection. For US Congress, incumbents Sen. Bernie Sanders (I) and Rep. Peter Welch (D), handily won reelection, at, respectively, 67 and 69 percent of the vote. Hopes were high in some quarters that Christine Hallquist, Democratic candidate for governor, would somehow buck precedent and beat an incumbent gubernatorial candidate, which hasn’t happened in Vermont since 1962. She was also seeking to buck the status quo: Vermont has had only one female governor in its 240-year history (the first dozen years as an independent republic), and Hallquist was on track to become the nation’s first transgender governor. Unsurprisingly, Hallquist lost, garnering 40 percent of the vote to Phil Scott’s 55 percent (the remaining votes were cast among the four third-party candidates). But these results are, arguably, still impressive, given the challenges she faced. Listen to Your Mother: Do You Know Where Your Garbage Goes? Times have changed, says Coe, who is now secretary of the citizens group DUMP (Don’t Undermine Memphremagog’s Purity). Today, that dump has grown into a 78-acre landfill, operated by Casella Waste Systems. The only operational landfill in Vermont (dubbed Mount Casella by locals), it sits on a 627-acre parcel that abuts wetlands and, most importantly, the Black River, which empties into Lake Memphremagog, the drinking water source for 185,000 Quebecois. About 70 percent of the state’s trash ends up there, mostly from the northern two-thirds of the state. Every day, approximately 100 trucks bring waste to the landfill, dumping over a half million tons of waste annually. Another 25 percent is trucked from other states (N.Y., Mass., R.I., N.H., Conn.), much of it contaminated soil, medical waste, coal ash, sludge, asbestos, and construction debris. In summer 2017, Casella applied for a permit to add a 51-acre expansion to its current operation. According to Casella, it is not seeking to expand the capacity of the landfill but to increase its longevity, and it has not requested an increase in the amount of waste it can receive. In early October, Casella received preliminary approval from the state for its request. However, Casella still must clear the Act 250 permitting process and receive a wastewater permit.